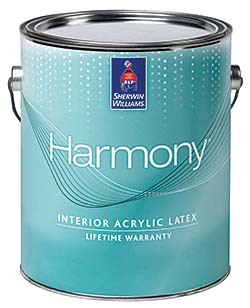 Harmony acrylic latex features no volatile organic compounds and provides a washable finish. Formaldehyde-reducing technology limits the amount of airborne concentrations from sources such as carpets, cabinets and fabrics. The odor-free technology reduces ambient odors of organic origin. The water-based paint also contains anti-microbial agents to inhibit the growth of mold and mildew on the paint film and inhibits related bacterial odors. The paint's durable finish also withstands frequent washings.